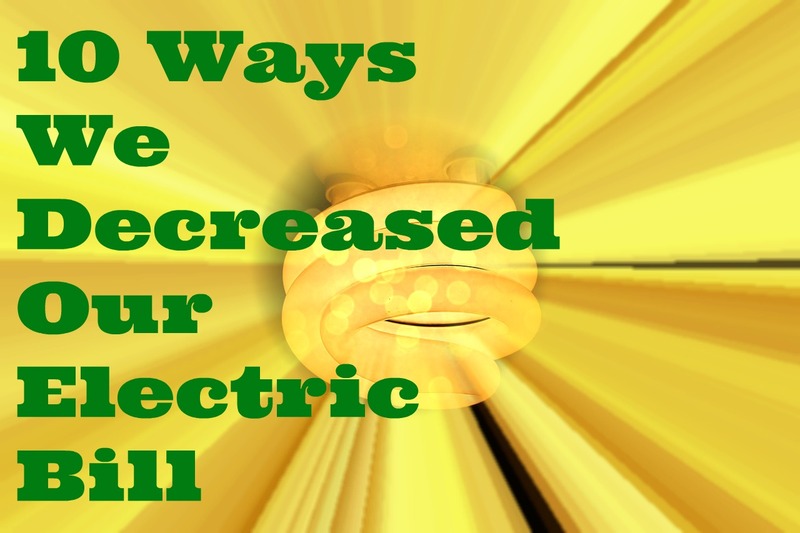 This post was inspired by two of my friends on Facebook who drastically reduced their electric bills and in turn gave me hope that I could do the same. Over the last 2 billing cycles (our bill comes every other month) we have kept our electric bill around $111. That makes me so happy because our bill was normally $160 which made no sense. The lowest we ever got it was $130 so when I saw a $50 savings on not just 1 bill but 2 bills I knew what we were doing was totally working and had to share these awesome tips with you because who couldn't use an extra $50. So to give you perspective, below are the last 3 bills we received and the amount so you can see the savings. We have our TV, game systems, computers and chargers all on power strips naturally but more recently I put our lamps and smaller household appliances on power strips too. I believe it has saved us a lot. Also the key to using power strips is turning the power strip off when the items are not in use. I now make this part of my nightly routine before I go to bed. I turn everything off at night with exception for the stove, refrigerator, washer, dryer, modem and phone chargers. Only exception is my hubby's computer sometimes he's doing things and has to let it run overnight. I don't like it but it's not often. This is so key. I don't unplug the power strips but if I have small items that aren't on a power strip I make sure to unplug them at night or when I'm not home. Even your microwave, I can't unplug ours because it's over the stove and it would be a hassle to get a stool and plug it in every time we needed to use it. However if you have a microwave consider unplugging it because even when it's not in use it's still drawing power to keep the clock on. Same with any electronic that displays time even when off or standby mode, just unplug it to save energy. Whenever possible I try to use natural light. Especially since it's summer and the days are long. There is no reason to use the lights or a lamp during the day. I open the blinds and use the light for as long as I can. I will admit this took some time to adjust to, I had to practice not turning on lights during the day. Another one that I didn't realize how bad I was at until we starting trying to do it. We find that in the mornings or night when we are trying to get ready we have the most lights on because we're in the kitchen trying to make breakfast, then going into the room to grab something and then sitting in the living room for devotions. It can be a mess and we don't have kids. Now we just turn off the lights if we leave a room. Sometimes we do forget but overall we are a lot better. Our apartment has a washer and dryer which is awesome but sometimes it's not because of our bill. Recently I have been washing as much as I can in cold water. I read that using hot water uses more energy since the water has to be heated. I've also decreased the frequency that I wash I my clothes. I would wash weekly now it's every other week. This is helpful in the summer since it gets really hot where we live. Using the dryer usually adds fuel to the fire. I don't use the dryer except for items that are huge like linens, blankets and towels. I will air dry everything else. I want to invest in a clothes drying rack so that I can eliminate the dryer completely except for the aforementioned items. I feel like I would need a clothesline in order to air dry those over sized items. I honestly didn't realize I had the heated dry button turned on but I feel like there hasn't been much difference in our dishes. They are dry when we open the dishwasher and that's the most important part. When it's cold my hubby is the first one to turn one heater (sorry babe but it's true). This past winter, yes I know I live in California and it doesn't get as cold as the east coast but when 75 degrees is your normal and it's 50 or 60 degrees that's cold to us. Don't judge us please. We don't know any better. :) Anyway, I challenged my hubby to bundle up before turning on the heat. If he wasn't warmer in 30 minutes then we could turn on the heat. Sometimes it worked and sometimes it didn't but I'm proud of us for trying and the times we used blankets and thick socks to stay warm saved us money. Okay so we may not know about the cold weather but boy do we know about the hot weather. We had a heat wave the winter before last so yeah we're used to hot weather but sometimes it can be unbearable. We do our best to open the windows and pull in a breeze. Lately we've been lucky but once we hit the dead of summer it's all standstill. Our goal is to use our AC only on the days that are ridiculously hot like over 95 degrees. In the meantime we open all the windows and blinds, pull back the curtains and let the air circulate in our apartment. This summer we are planning to buy a fan so if we do turn on the AC we can use the fan to circulate the air all over since some areas in our apartment tend to get cooler faster. This last tip takes some research and will vary depending on where you live and the company that manages your electricity. In my area there are a few different ways we could be charged, one is dependent upon our use and the other is dependent upon the time of day we use our electricity. My husband and I are charged in a way that has nothing to do with the time of day we use our electricity. It's about how much we use and not when we use it. It took some time to look it up on our electric company's website. If you know the way you are charged then that can help determine if you should use your electricity differently. I was shocked. I thought for sure doing laundry at night opposed to the morning would help our bill. It didn't, there is a special rate option you can apply for if you are at home during the day and meet other eligibility requirements however we don't qualify. I've done this in the past and asked for a breakdown to see what room in the house uses the most electricity. They've gotten so specific as to tell me which socket had the most energy being pulled from it. The Electric Company always has tips and ways to help you save through programs, rebates and information on best practices. Contact them today to see how you can save. That's it! That's how we have maintained a $50 savings on our electric bill. My next goal is to get our bill under $100. If I do that I will be so impressed with myself. 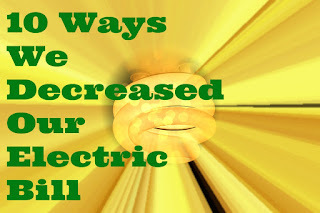 Let me know down in the comments if you have other tips that weren't mentioned to help others save on their Electric Bill. I'd love to hear from you and as always thanks for reading!! !